← A cup of tea, please!! Wow…..Is it February already???? When did that happen?? Nearly Valentines again!! OMG!! Marshmallows have been a lifelong favourite of mine, so when I came across a recipe for Vanilla Bean marshmallow, it was a no brainer really!! Grease a baking tray. Combine the icing sugar and cornflour in a large bowl. Pass the mixture through a sieve into another bowl positioned underneath to ensure it is well mixed. Liberally sift some of the mixture over the greased baking tray. Whisk the egg whites until they form firm peaks (preferably in a food mixer or with a powerful hand-held electric whisk). Set aside. They will separate slightly, but you can whisk them up again quickly just before you need them. Combine the caster sugar, glucose syrup, scraped vanilla pod and the seeds, and half of the water in a small pan over a low heat. Stir to dissolve the sugar. Bring the syrup to a boil and boil until it reaches the hard-ball stage (130°C/266°F). Meanwhile, soften the gelatine with the remaining cold water in a small pan, off the heat. Just before the sugar syrup reaches the hard-ball stage, place the gelatine mixture over a low heat and stir to dissolve. When the syrup reaches the correct temperature and the gelatine has dissolved, combine the two. Stir in the vanilla extract. Turn the electric whisk on again and whisk the egg whites constantly while pouring in the syrup and gelatine mixture in a slow, steady stream. Continue until all of the mixture has been incorporated. Whisk the mixture on a medium-high speed for at least 7 minutes, until it is almost stiff. Pour into the prepared baking tray and smooth the top with a spatula. Allow to set for about 5 hours. Dust a work surface with most of the cornflour and icing sugar, and turn the marshmallows out on to it by carefully inverting the baking tray. Cut into cubes and allow to dry out for a couple of hours. Dust with the remaining cornflour-icing sugar mixture to prevent the marshmallows from sticking together. Serve, or store in an airtight container or in cellophane bags. These look wonderful! Something different for Valentine’s day….lovely! I see you have an extensive recipe file and I will be coming back to check out more recipes. There are some tasty looking treats here! 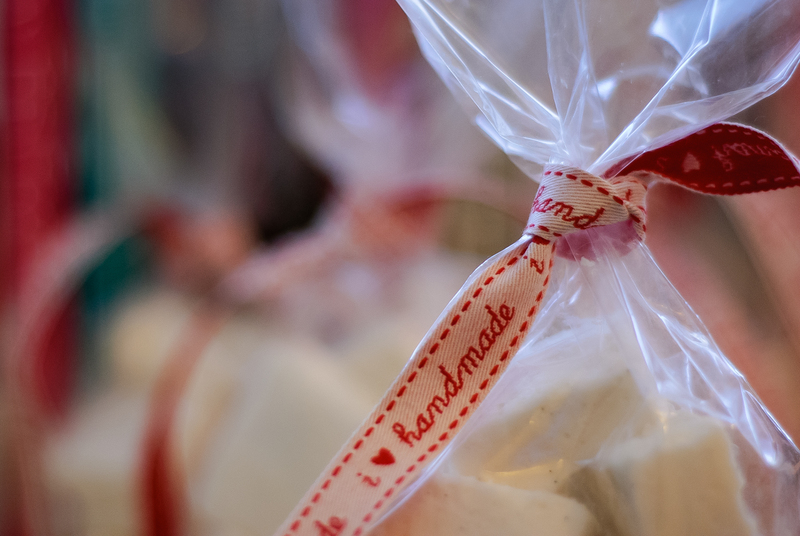 I love homemade marshmallows too! They are so soft and gooey. I like your “i ❤ handmade" ribbon! Where did you get them? 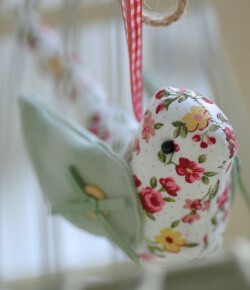 I’m totally in love with those ribbons too! 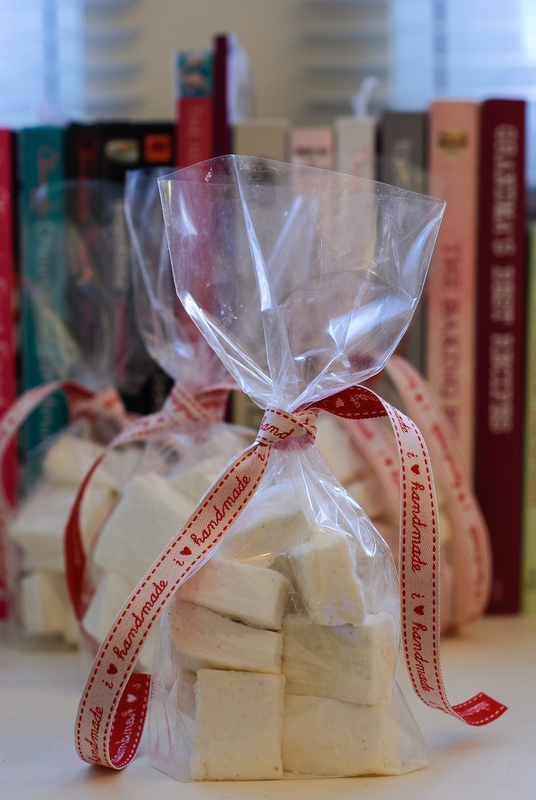 Thanks for liking my post, that was seriously quick as I only hit the publish button, these marshmallows sound amazing, going to have to give them a go soon. Oh my gosh, nothing beats homemade marshmallows! They look beautiful and delicious, I must try this sometime! Yes, time flies, doesn’t it! Loving your blog and the recipes. 🙂 Thank you so much for sharing! Happy Valentine’s Day in advance~! What a tasty looking bag of marshmallows. I tried making homemade marshmallows once and it was a disaster It was a complete mess. LOL At least I can laugh at myself. 🙂 I should give your recipe a try, maybe I have more experience in the kitchen now and I’ll have success. I love the way you packaged them! Oh my goodness – this was one promptly added to my Pinterest site!! Can’t wait to try them out. How delicious and enticing do they look?! marshmallows must have been THE thing this Valentine’s day:-) I’ve made two batches (chocolate chip and bourbon-caramel) in the last two weeks alone! (see foodforfun’s marshmallow throw-down for more) And have seen numerous other posts on mallows as well. You have a classy blog going on–it’s lovely. Pretty design, great design, yummy food. Appreciate you visiting foodforfun for the cornbread. Your Like is exactly what I meant when I talked about connections. You hit Like, I found you, and now I have another marshmallow friend! How can it get better than that? Oooh I love marshmallows. I’ve been browsing through your blog, you have such interesting recipes! Marshmallows have been on my “food bucket list” for a couple years now. Maybe I’ll work up the nerve to make them by the end of the year for Christmas gifts 🙂 Thanks for sharing! I LOVE marshmallows and have never tried making them homemade! It looks delicious! I love marshmallows! I’ve never tried to make them myself but these look delectable and are just enticing me. i love vanilla bean and marshmallows, so this is perfect!